I’m glad that I’m a dad to both a boy and a girl. Each child brings out something different in me. Josie had looked forward to this day for two months. She made her own countdown calendar. Finally the day came. Up early. Clean the house. Decorate the house. My dear wife becomes an incarnation of Martha Stewart. The birthday cake is home-made. From stratch. Three different kinds of frosting–on with cream cheese, one with sour cream, and one with something else that I can’t remember right now. Josie asked for yellow cake with pink frosting on the insides, yellow frosting on the tops, and chocolate frosting on the sides. I’m not kidding. She’s a little Margi. She also asked for yellow flowers with green leaves to adorn her cake. What amazes me is that she had this vision of how her cake should look! And her mommy understood it and pulled it off. I’ll go clean the bathroom. That’s more in keeping with my skills. Thank God for our friend, Auntie Gail, who helped decorate and clean. Gail, you’re a great friend and neighbor! We couldn’t ask for a better friend! I’ll go clean the swimming pool. That’s also more in keeping with my skills. I’ll also blow up inflatable things. That’s also in keeping with my skills. The party begins at 1:00 on Saturday. The grown ups are already exhausted. A treasure hunt… all over our yard. It ended on the jungle-gym, where each girl found a crown. The birthday girl was in her element–laughing and skipping and running with her girlfriends. Snack time. Fresh fruit and home-made cookies. Home made punch that was green (according to Josie’s desires) with green things and sherbet floating in it. Later on my precious wife would break that punch bowl as she puts it away. It was its maiden voyage. Game time. Relay races in the grass. 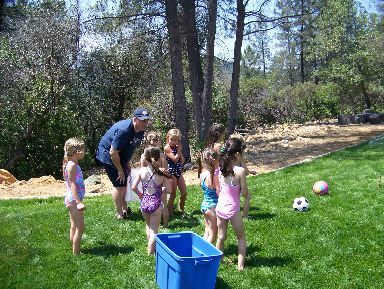 Kicking soccer balls in the grass with the sprinkler system running. Lots of screams. Retrieving lots of little balls from the grass with the sprinklers running. More screaming. Many years as an Awana leader sure come in handy when you have to plan and run games with kids. Lots and lots and lots of screaming. Snack time. Then POOL PARTY! I can’t stand a cold swimming pool. My skin shrinks and wants to crack, so I just stayed out of the water. The pool was 77-degrees. Cold. But not for these stick-thin little girls. They jumped right in, no problem. Auntie Gail became de facto lifeguard when she accidentally fell in. We bought these two really cool cheap plastic blowup boats from Walmart with motors. Kind of like skidoos, only 1/100th of the price ($29). One (brand new) had a leak. The other was fine. 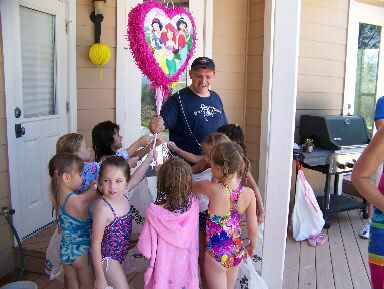 It was a hit with the girls. 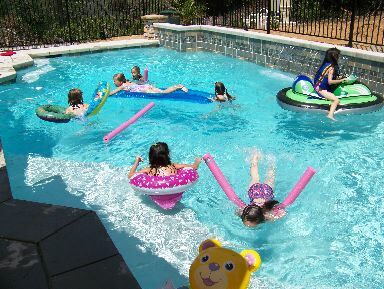 Lots of splashing and swimming and parents hanging out. Good times. Josie was in her element… sheer happiness on her face. Next came the pinata. Ashley has a great swing. Finally, pinata breaks, and we see avarice at its finest. Then time for cake. Dry off. Go inside. Sit around the table. Light the candles. I prayed a blessing on my daughter and on all the girls. We sang happy birthday. Josie blew/spit out the candles. The look of delight on her little face warmed my heart. Ymmmm. Between kids and grown ups, almost all the cake went. I suspended my low-carb lifestyle to have a piece of cake. Delicious! Great job, honey. Move over Martha, Margi’s in town. It was the only thing I had eaten so far (now about 2:00) that day. Then time to open presents. 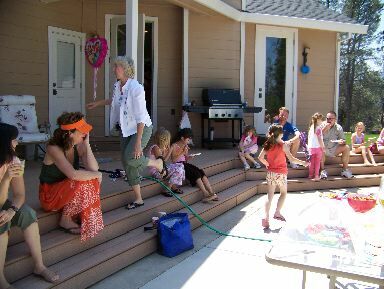 I watch a few presents, and then scoot, leaving the kids with Margi, Grandma, Aunt Lucy, Auntie Gail, and about 5 other adults. I have to get ready for church (we have a service on Saturday nights). 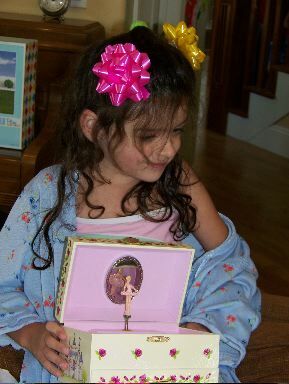 I get cleaned up and dressed and am back in time to watch Josie open the special ballerina music box from mom and dad. A ballerina spins to the tune of “Swan Lake.” Josie is enthralled. I am therefore enthralled. I kiss my wife and kids and say goodbye to kids and parents and race to church to finalize my sermon, my powerpoint slides, and to prepare my heart for worship. The whole party was a preparation for me. I worship God for my family, my daughter, and her friends. By the time church is over, I’m wiped out. So is Margi. That night, as I put Josie to bed, she had tears in her eyes. “What’s the matter, honey?” I asked. “I’m going to forget this day. We didn’t take any video. Can we have all the kids come back and dress the same way and wrap all the presents in the same paper and take a video?” Big tears well up in her eyes. “Oh, honey! We took lots of pictures and I can make you a video from the pictures!” You won’t forget this special day, ever!” She smiles. The world is good again. The next night, as I put Josie to bed, she remembered something. She ran to get the bead-necklace she had just made with her own little hands. She carefully placed it into her new ballerina music box. I asked her what else was in there. Josie opened a drawer. In it were little scraps. She said, “I know it looks like junk, but it will help me remember my party.” She had cut little pieces from the streamers and saved them in her music box. Little scraps from the wrapping paper. Little pieces of the gift bags. A candy wrapper. A piece of ribbon. A piece of the pinata. A collection of memories. She definitely will not forget her magical day. In that moment, Josie made every ounce of energy worth it. I’m so glad that I’m a daddy to a little girl. Josie is really precious. I really relate to her keeping shreds of pieces of things to help her remember, I still do things like that!! That’s why my room is so overcrowded with stuff… too many memories. Anyway, Josie, I totally understand. Happy Sixth Birthday, Josie!! 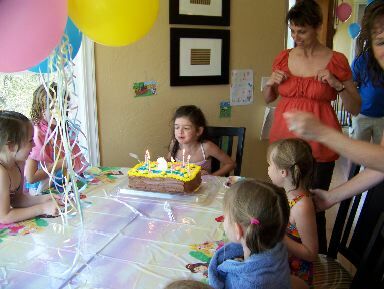 We have a six-year-old granddaughter, too, and she had a smashing party as well! It’s great to be six!! Also, great to be the parents and/or grandparents of a six year old! Yippee to all! Great blog. You seem to have an interesting little girl! That made me think of how I can’t wait to be a Dad. I love how when you blog about something that happened in your week you can make something out of it, or tell a lesson. I should work on that! What a sweet little girl, that music box is will be treasured!! Big day, I didn’t even know you were tired at Saturday night’s service..